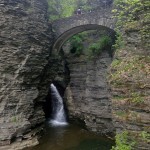 The first waterfall and first bridge at Watkins Glen. 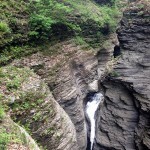 The second waterfall at Watkins Glen. 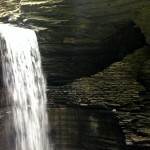 Cascade Cavern, where the water flows over the trail. I woke up freezing, at first light at the Gold Beach Campground. Not wanting to greet the day at four AM, I burrowed deeper into my sleeping bag (I wish I were a shorter person) and zipped it clear over my head. In my mind I kept telling myself that I was being a wuss, that it really wasn’t that cold, and that my dad had camped on glaciers in temperatures well below freezing. I also reminded myself that there was no way it was even in the 30s. It had to be at least 45, I thought. Fortunately, I was able to sleep for about another hour and a half. The second time I awoke it was considerably brighter. There was no denying that it was time to get up. I made a mental note that, despite my dwindling funds I should buy a foam pad to put under my sleeping bag to insulate me from the cold ground. I stumbled out of the tent and was again floored by the view. There was fog hanging just above the surface of the lake, the Loons were still calling, and the Canadian geese were drifting about. Surprised to see that my phone’s battery had survived the cold, I took a couple of pictures of the lake. I called out to wake Paul, and began to take down my tent. As I unhooked the tent fly, I noticed that the dew had frozen into frost. Brr. And get out of there we did. We had planned to spend the last night at Watkins Glen in the Finger Lakes region of New York, a place my parents had visited on one of their trips back East. Despite not being able to camp there at the end of today, we planned to still drive through and try to hike through the state park, so we headed that direction after stopping for breakfast at a diner in Iron Forge, NY. We made it Watkins Glen with plenty of time to spare. After parking in the state park lot ($8) we headed up the gorge trail. 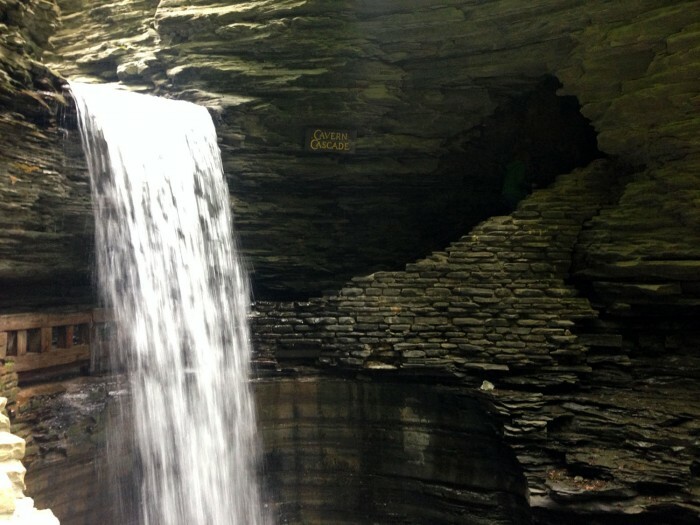 Watkins Glen is a sandstone and limestone gorge carved 400 feet deep into the New York woods. Glen Creek, a small creek has carved its way through the stone creating deep pools where the stone is soft, and beautiful waterfalls when it reached a harder layer. The trail through the gorge can be taken as a loop, or down and back. The narrow trail is mostly over uneven stone, and is often wet. The views are spectacular. Though the park claims that there are nineteen waterfalls along the trail, my mom told me “that’s only if they count every drip.” Regardless of quantity, the waterfalls are awesome. Some parts of the gorge are very narrow, and others a little wider. I would love to have jumped in, but I doubt the park staff would have smiled on that behavior. The top of the trail is another point of entrance. The last part of the trail is a series of stairs that are reasonably steep. At the top, we took a walk through the gift shop (since there was nothing else to see there). The gift shop was selling “I survived the stops” t-shirts, which made me chuckle. If visitors to Watkins Glen think a few hundred steps are rough, they should head over to the Mist Trail in Yosemite National Park, which has over 600 near vertical steps in a row. We walked back along the Indian trail, which had precious little to offer in terms of views or anything else, really. If I were to do it again I would walk back along the gorge trail. We returned to the car and headed over to Walmart to buy some things for dinner. After Walmart we pressed on, making it to Allegheny State Park in Southwest New York by about 10 PM. We hadn’t intended on arrive so late, but ended up taking a back road into the park. The state campground at Red Lodge was packed and noisy. We tried to find someone to register with, but the gatehouse was closed with a sign directing us to the camp store. The guy at the camp store told us there was a list of available sites on the gatehouse. There wasn’t. We took an open site, set up camp and tried to get a fire started with the wet wood we bought at Golden Beach. We got it lit, but didn’t have enough dry wood to keep the large, wet pieces lit. We turned in pretty quickly afterwards.